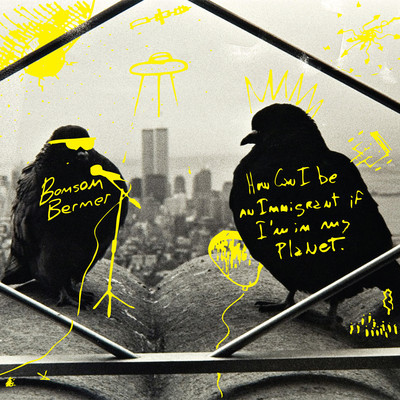 Bonson Berner, a Los Angeles-based Indie band, wonders How Can I Be an Immigrant If I’m On My Planet, the title of their new album. In a similar vein, I’m wondering how can I be a nomad if I have my own home. Okay, maybe that’s not too similar. In 1988, glam-band Cinderella released “Don’t Know What You Got ‘Till It’s Gone,” and while the song is a classic example of terrible 80’s power ballads, they do make a good point. Hurricane Sandy knocked off the electricity in my house, and the power authority has yet to turn it back on. Thus, no heat or lights. I have become a nomad, traveling from home to home, crashing on couches (mainly) in exchange for affable company. Thus, posting has been difficult. It is eerie in New York. The last two weeks have gone by in slow motion, and, we can only hope that this weekend brings an end to this tired movement. Since I am currently in an area with internet connection, I do want to lose an opportunity to provide you with some great new music. 1988 also saw the release of the Talking Heads’ final album Naked. The 80s were not a complete wasteland for music. Bonson Berner, the band I would like to focus on today, plays a call-back style of music reminiscent of Talking Heads percussion and synth. Bonson Berner is the product of musicians Pato Aloi, who, after forming an influential indie band in Argentina called Siga La Flecha, created a musical project with local musicians and titled the consortium Bonson Berner. How Can I Be an Immigrant If I’m On My Planet is the band’s first release, and it was produced in Argentina and Los Angeles. “Running Days” moves with its inventive percussion and synth. Diego Cuevas, synth, and Blair Shotts, drums, lay an itinerant track that persists through the short piece with strength and toe-tapping rhythm. The percussion is what immediately reminded me of the Talking Heads, who also stressed constant rhythm in their songs. Gustavo Limon emphasized this rhythm in his guitar. The song, though, is carried by Aloi’s croon. In a style similar to The National’s Matt Berninger, Aloi’s voice masterfully rises and falls, and, much like the percussion, remains a constant force. The stop-motion video is well done and matches the song well. “Movement 4” moves similarly, but it features more of a light South American guitar, which provides an intriguing juxtaposition between American and South American indie music elements.